Complete Carrollton, TX accident reports and news. After a Carrollton crash, injured people and their families need resources and support. Regardless of the severity of the collision, the people involved are left to deal with injuries, medical bills, property damage, and insurance claims. When a Carrollton accident is fatal, families are left to struggle with their grief and loss as best they can. Major hospitals in Carrollton include Methodist Hospital for Surgery. How do you deal with an insurance claim after a Carrollton accident? Regardless of how severe an accident is, almost everyone involved has to deal with insurance companies and claims. For accidents with very minor injuries and damage, a claim can sometimes be handled by working with the insurance adjuster. For crashes involving more serious injuries, or when a fatal accident occurs, a personal injury attorney is needed to manage the insurance claim. Go here to learn more about how a Carrollton injury lawyer helps accident victims. A Carrollton injury attorney handles all the details so that you don't have to. After a Carrollton accident, there are many issues that need to be handled immediately. Dealing with doctors, repair shops, car rental companies, police, and insurance companies is overwhelming, especially when someone is seriously injured. At this point, many injured people choose to hire a Carrollton personal injury attorney whose job it is to handle the details and paperwork so that you can focus on recovery. What types of accidents and injuries does a Carrollton personal injury lawyer help with? Carrollton wrongful death claims and legal resources. 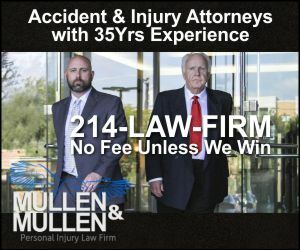 After a serious crash, it is crucial to get help from an experienced Carrollton personal injury lawyer who understands the local regulations and legal standards, who knows how insurance policies work, and who can handle all aspects of an insurance claim so the injured person can focus on recovery. If someone is killed in a collision, a wrongful death attorney will launch a claim that will begin the process of financial recovery for the family members left behind. If you were injured in a wreck, learn more about how a car accident lawyer can help you now in Carrollton. Mon, 01/06/2014 Truck Accident Two hurt, taken to hospital, after tractor-trailer strikes car and loses load on I -35.